This article is about the theme. For the LEGOLAND Windsor attraction, see LEGO City. City is the thematic title under which most Town-related System sets were released from 2005 and onward. There are numerous sets that are associated with Construction, Police, Fire, Emergency, Train, Airport, Transportation, Cargo, Traffic, Coast Guard, Farm, Great Vehicles, Mining, and Space. European catalogs featured another theme called City in the years 1999 to 2000, which was referred to as City Center in American catalogs. 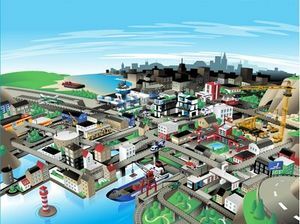 After World City's discontinuation in 2004, it was replaced with City as System's primary town-life related theme in 2005. However, unlike its predecessor, it was not limited to sets involving rescue services like Police, Fire or Coast Guard, but also introduced the first new construction site related sets since the discontinuation of City Center in 2000. In 2006, the first new airport set that included the first jetway since 6597 Century Skyway (1994) was released, as well as the first new hospital since 6380 Emergency Treatment Center from 1987. These releases expanded City to a scope only comparable to the original Town theme, and in 2009 it even went slightly beyond that, by introducing the first farm-related System sets. Also, in that year, City followed this route to release more truly civilian town life sets such as 7641 City Corner and 7639 Camper. 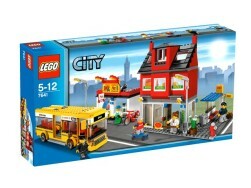 In 2010 City released more civilian sets including 8403 Family House and 8404 Public Transport. In 2011 City re-introduced the Space sub-theme along with some new Harbour sets. In the first wave of 2012, City had forest police and fire sets as well as some more commercial/civilian sets. 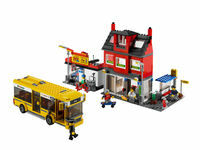 The second wave of 2012 featured the introduction of the Mining theme and respective sets, as well as a hospital. In the winter of 2013, Police and Fire sets were once again focused on but, contrary to those released in the previous year, were set in the city. In the summer of 2013, the Coast Guard and Cargo subthemes were brought back. On December 23 in 2010 LEGO released the LEGO Comic Builder on the LEGO City website. The user can create his/her own LEGO City Police comic easily with this. City has had many games since it was released. One in particular, The Robot Chronicles, was a cross-over game which saw the City, Racers, and Agents 2.0 all together in Lego City, where the player controlled and unlocked vehicles in each theme to play through a campaign. This campaign/game was also tied into a My LEGO Network The Robot Chronicles campaign- playing the game earned rewards in MLN which could be used in that campaign to eventually get the Key to LEGO City. Two LEGO City video games, LEGO City Undercover and LEGO City Undercover: The Chase Begins were released in 2013, with the latter being a prequel to the former. This page was last edited on 8 December 2018, at 12:11.